The American music critic and lecturer William James Henderson (1855-1937) wrote for The New York Times and The New York Sun, provided the libretto for Walter Damrosch's opera Cyrano (1913) and authored fiction, poetry, sea stories and a textbook on navigation. He also taught at the New York College of Music and the Institute of Musical Art. Taking up the cause of Wagner with considerable understanding, he published this substantial work in 1902, barely twenty years after the composer's death. It is an illuminating account of Wagner's life and artistic aims, complemented by an insightful analysis of each of his music dramas from Rienzi to Parsifal. Its purpose, states Henderson, 'is to supply Wagner lovers with a single work which shall meet all their needs'. 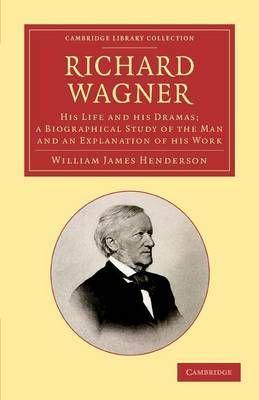 With Ernest Newman's Study of Wagner (1899), also reissued in this series, it reflects the composer's contemporary popularity.